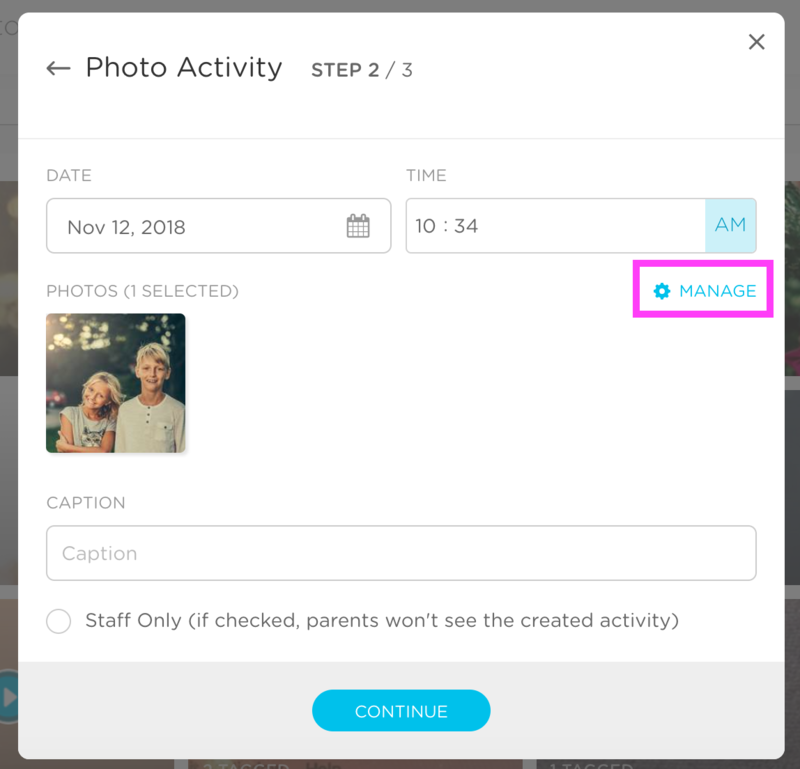 To view sent and unsent photos in a gallery format on the website, go to the Daily Activities page and click on the "View Photos / Videos" link in the upper right (highlighted here in red). Note: We say a photo has been sent or tagged when it has been sent to at least one student. media type (photo or video). 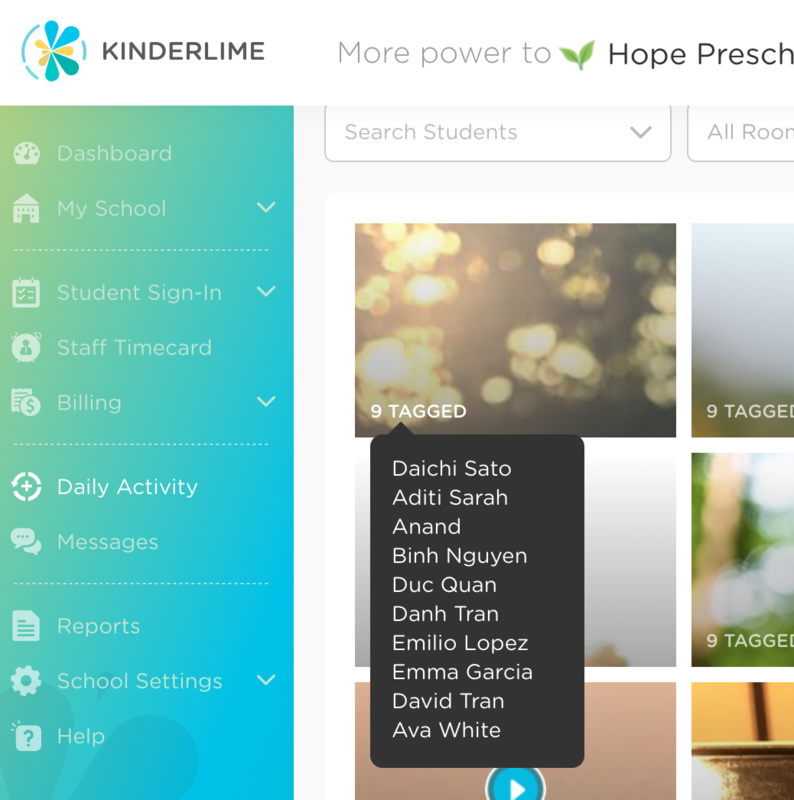 Click on the Unsent link to view photos that have been saved to the Kinderlime Cloud. You can filter these by room or media type. You will notice that all photos will have a number in the lower left indicated how many students have been "tagged." If you hover on that number, you'll see a drop-down list of all the students the photo has been sent to. 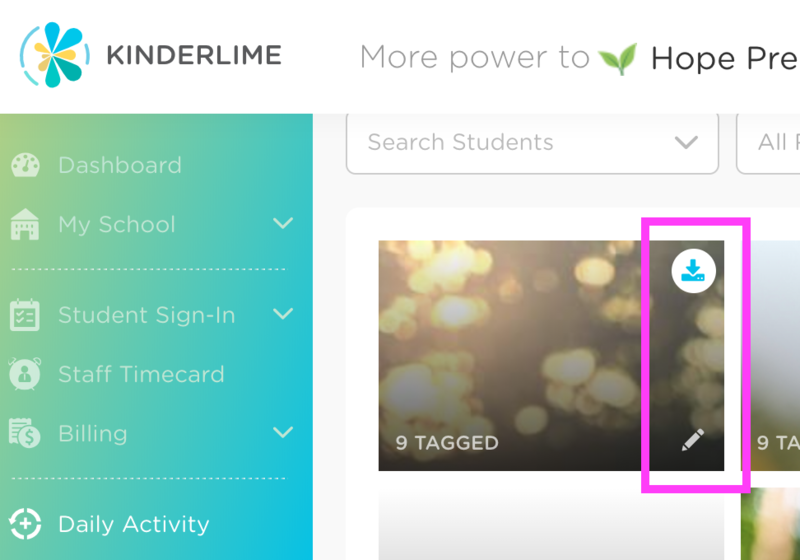 When you hover your mouse over a picture, you will see a download icon in the upper right and a pencil icon in the lower right (indicated in pink below). Click on the download icon to open the photo in a new tab. From there, you will need to right-click your mouse and select "Save as" to save the picture to your computer. To send or resend a photo, click on the pencil icon. You'll see a pop-up with the picture selected. If you would like to add more pictures to send, click on the Manage link (indicated in pink below). From there, you will be able to choose more photos from the sent or unsent tabs. Use the caption field to add a message or note to the parents. You can also adjust the time or date. Once you're ready, click "Continue." Select the students and send the picture(s). Note: For photos that have been sent, you can not UN-SEND them. It's like sending an email -- once it goes out, you can't get it back.